No matter how much I love my store-bought coconut milk, it doesn’t even come close to fresh homemade coconut milk. The taste of fresh coconut milk is so clean, so refreshing, so fragrant. It’s just like fresh coconut in the creamy liquid form. You can use it to enhance the flavor of a myriad of dishes – from smoothies and shakes to soups and stews – or just sip it on its own. A fun fact about coconuts. In Sanskrit, coconut tree is known as “kalpa vriksha”, which translates to a “tree which gives all that is necessary for living”. And it’s true. You could literally live off of coconuts for several months if you needed to. But very few people have ever actually eaten a fresh raw coconut, besides that one time in Mexico, of course. So why don’t we eat fresh coconuts more often? Well, I would guess that you’re probably not growing coconuts in your backyard. And even if you were, it’s pretty hard to crack them open. Once you do open them though, you can use all that beautiful white flesh to make our own milk. While having milk from fresh coconuts is out of this world, there are other ways you can make coconut milk at home. You can use already cracked and peeled coconuts (i.e. intact young coconut meat with coconut water still inside), dried shredded coconut, or coconut manna. Be aware that the flavor of homemade coconut milk is much more pronounced compared to the coconut milk from the store. 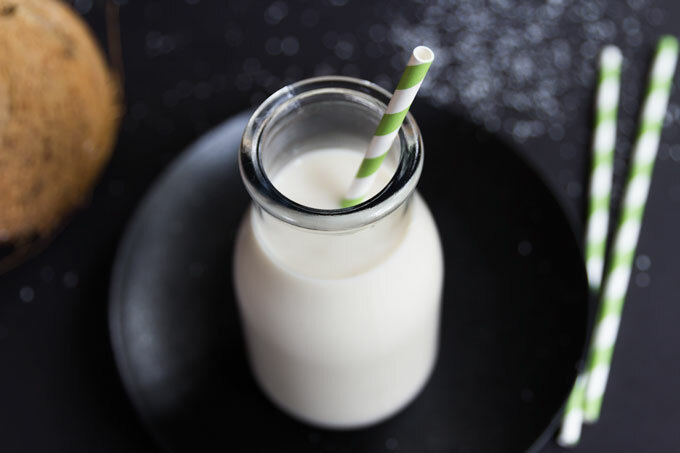 So if you want more neutral tasting plant-based milk, go for homemade almond milk instead. When it comes to making coconut milk, you have a few options – brown (mature) coconut, white (young) coconut, or shredded coconut. (I don’t recommend using desiccated coconut because I find it too dry and bland). Depending on your location, you might have a hard time finding fresh coconuts. If that’s the case, use unsweetened shredded coconut. In fact, I prefer homemade coconut milk from shredded coconut over fresh because the coconut flavor of shredded coconut is much more mellow. Making coconut milk from shredded coconut is also much faster and easier. Sometimes you simply don’t have the time to crack the coconut open, drain the coconut water, extract the coconut flesh from the hard shell, peel the brown bits, chop the flesh into smaller pieces … you get my point. I’ve seen many recipes calling for coconut water as the base liquid for coconut milk made from fresh coconuts. Well, not my recipe. I find the flavor of coconut water really strong. It completely overpowers the mellow flavor of coconut milk. So unless you want your coconut milk taste like coconut water, use good old water as the liquid. Also, the hotter the water, the better. The hot water softens and steeps the coconut, resulting in an easier blending and better flavor. Without an emulsifier the coconut milk naturally separates and is a little clumpy (the consistency of curdled milk with a very solid top layer) when chilled. Sunflower lecithin helps to keep the coconut milk more homogenized. You’ll still see some separation, even with the use of sunflower lecithin, but that’s normal. 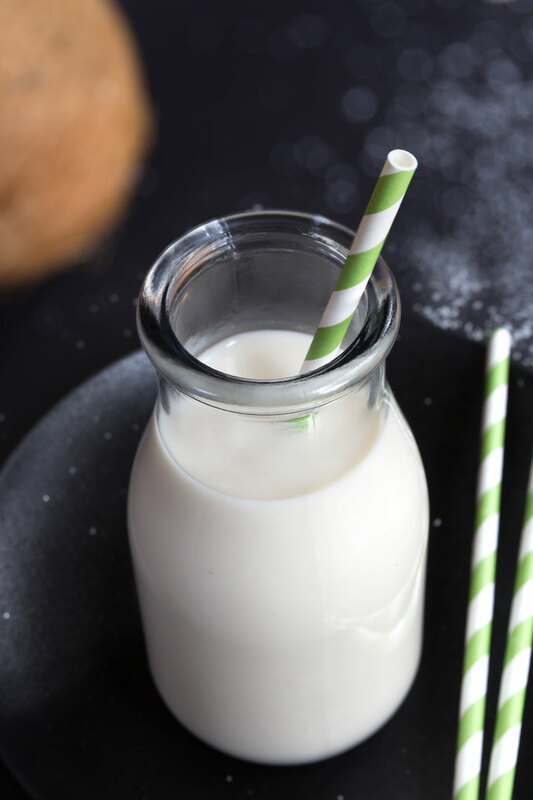 Separation happens even with store-bought milk – that’s why you’re supposed to “shake well”. Whether you use it or not is completely optional. After all, one of the reasons you might be making homemade coconut milk is to avoid any additives. That said, sunflower lecithin is actually a dietary supplement beneficial to the brain and the nervous system. The thickness of your coconut milk really depends on your needs. Always start with smaller amount of water and add more as you go. Fresh coconut – 1 cup fresh coconut flesh to 3/4 cup hot water produces thick milk ideal for desserts, ice cream, or puddings. 1 cup coconut to 1.4 cups water is similar to the texture of canned coconut milk. 1 cup coconut to 1.5 cups water is great for drinking or as a liquid for smoothies. Shredded coconut – 1 cup shredded coconut to 1 cup hot water is the standard ratio for desserts, such as ice cream or puddings. 1.5 cups coconut to 2.5 cups hot water is about as diluted as you want to go to replace the taste and texture of canned coconut milk. 1:4 is best for drinking or perhaps as a liquid for smoothies. A powerful blender is a huge advantage in this recipe. Sure, you can make coconut milk with a regular blender too, but the taste won’t be so well rounded and full. You really want to get the most out of that coconut flesh. You’ll notice, as you’re blending the coconut flesh, that it will get looser and looser and will spin more freely after a while. The texture of the milk should be granular only slightly. I always use a nut milk bag to separate the coconut flesh from the liquid. However, you can also use a cheesecloth, paint-straining bag, or fine mesh sleeve. The squeezing part is really important. You want to squeeze the coconut flesh as hard as you can. You should essentially end up with a very dry and tasteless coconut flesh. Fresh homemade coconut milk using freshly cracked coconuts or dried shredded coconut. It's clean, refreshing, and so fragrant. Crack the brown coconut open - using a drill, a screwdriver, or a very sharp knife, poke a hole into the coconut. At the top of the coconut, there are three eyes or indentations. One of these is usually the weakest, so use a sharp knife to poke each one. Collect the water from the coconut. After all the liquid drains out, Wrap the coconut in a towel, and hit it with a hammer or a meat tenderizer a few times until it cracks open. Using a knife, extract the coconut flesh from the brown shell. Crack the white (young) coconut open - shave off the husk around the top of the coconut until you hit the shell. Then take the heel of the large knife and firmly break through the shell. Drain the water from the coconut and then spoon out the flesh with a spoon. Add all the ingredients (coconut flesh and water) into a blender and process on the highest possible speed for at least 5 minutes to get the most out of the coconut. Transfer the content of the blender into a nut milk bag (or a cheesecloth) and squeeze all the liquid out of the coconut. Squeeze until you can't get another drop out. You'll be left with a very dry, tasteless coconut flesh. Transfer the milk to a jar or a covered bottle and refrigerate. Store leftover coconut milk in the refrigerator for up to 4 days, though best when fresh. Combine the coconut and water in a saucepan and bring to a full boil over high heat. Turn off the heat, cover, and let sit for 1 hour. Pour the coconut and water into a blender and process it on the highest speed for at least 5 minutes. The texture should be only slightly granular. What is the emulsifier that you use in the video? Hi Manuela – I am not using any emulsifiers. I can always spot them in plant-based milks and really don’t like the flavor. You do mention them in both the video and the blog, however. Do you have any directions or can you point us in the right direction of how we me might add emulsifier to these milks? Hi Anthony – yes, I do mention the lecithin because of separation. However, I can always detect the flavor of lecithin in the milk so I don’t usually use it (that’s why it’s not mentioned in the actual “recipe”). Emulsifiers are really easy to use though. You can find the lecithin in a powdered form or liquid. When I use lecithin, I add 1/2 Tablespoon of powdered sunflower lecithin into 2 cups of coconut milk. Then I blend the whole mixture until the lecithin completely dissolves. You might not even notice the lecithin is there (my husband never does), but I can always tell, lol. Please, let me know if you have any other questions! Hi, what brand of shredded unsweetened coconut to you use and where do you buy it from? I’m in the UK and can seem to only find shredded desiccated coconut online, or much more expensive shredded sweetened coconut (used for baking), but I’m wondering whether I’m not looking for the right thing.